Derrick says he needs her help to get to the truth of something. He was talking to Donny, You know how Donny and powpow were super close. a couple days before the Eviction POWPOW and Zach got really close and before powpow got evicted Zach told her a secret. Zach told POWPOW that he’s AManda zuckerman’s cousin. POWPOW told Donny that on his way out the door. Derrick wants her to find out from Brittany if she’s heard that rumour don’t tell her who you heard it from. Derrick says Donny told him, he wants her to makes sure nobody is around when she talks to Brittany. Victoria says it makes sense they are both jewish and they are both annoying as hell they are from the same area. Victoria did noticed that but why would he tell her that. Derrick – thanks .. you just like older guys sorry. Derrick doesn’t think there will be any showmances this year. Victoria thinks Hayden and Jicole will. Derrick says most likely donny will use the veto to save Jocasta.. if he doesn’t there is a real risk of her going home. They don’t know who Caleb is working with he only needs 6 votes to stay if it’s a tie Derrick will vote to keep Caleb. They bring up Donny and Devin double D’s alliance. Derrick says he never talks to Donny about game all he knows is Donny came into the house after winning the pov and gave the necklace to her. That’s not the actions of someone who won’t use the Veto. Victoria says she wants to tell him something.. she doesn’t want to go home because of it. Derrick want her to say. Jocasta got dehydrated that is why she’s so sick. Excessive use of laxatives dehydrated her. Talking about the POV competition. The Feeds good Try It Free! Get 24/7 access to the house PLUS more for 48hrs before you decide! All of a sudden production comes over the speakers says they are not allowed to discuss their votes.. Christine thinks that’s really weird. Nicole – What kind of mouth do I have from michigan do I have? Sounds like Devin said she’s “Mouthy”, “Filthy” or “Snobby” they can’t remember exactly. Christine says after DEvin goes up on the block she’s going to stop being nice to him. Christine and Nicole point out that Devin has tiny legs in comparison to the rest of his body. Christine asks her if she will be made if she wants Donny out. Nicole says she won’t Frankie tells them the game Frankie is playing is dangerous to the rest of them. Christine says Brittany drinks a bottle of wine every day she’s always talking about alcohol. Frankie thinks Brittany is trying to jump ship with Cody. He’s been able to convince Zach that Brittany is eval but Derrick and Cody are not convinced yet. They think Caleb and AMber will be targets after Devin goes. He warns her that COdy, Derrick and Zach are an unbreakable alliance. Christine knows that. Frankie says JOcasta is going to become the new POWPOW. Christine says Jocasta will be her first nominee. Donny says before POWPOW left she said you watch out for that “douchebag” he told her Zach was Amanda Zuckerman’s cousin. Donny – “What do you think” Nicole doesn’t know what to think. Frog says she’s 100% certain there is an American player this season.”Just watch out for it is all I am saying” Frankie isn’t sure says he thinks there’s something that allows America to change the game. Cody says Amber is into Cody. Cody doesn’t think it’s a good thing at all. Zach talks about his conversation with Caleb. Cody wonders if Donny is going to use the POV on jocasta. Zach thinks he has to. Zach says he had a dream that Caleb goes home Cody says if Jocasta and Caleb stay on the block Hayden will flip and vote out Caleb, Zach “ya I would to.. But Donny is going to use it” They wonder if tehy can get rid of Caleb this week. Both of them would like to. Cody says they talked about it but decided it too early. I had high hopes from this cast but in a week they have all become so UNLIKABLE. I am actually enjoying this season so much more than the last 2. I really disliked last season and stopped watching it. The summer before was painful to watch. I like the assortment of people, but I wish they would stop voting as a house and vote individually. BB should say NO MORE asking who would you vote out if you are HoH or who are you voting for now. It would make the evictions much more enjoyable. It would be hilarious and embarrassing if Amber’s vote sent Caleb packing. How was that nice? You might dislike his gameplay or personality but it doesn’t give you the right to be this mean. Post a picture, Let me pick something about your body I don’t like, and make fun of you. I thought it was kinda funny. Let’s all jump on the Devin bandwagon, shall we? The guy is a mess. Amen. Ugh! Nicole & Victoria are just dumb! Play along with America’s Choice, will you!!! Amber’s into Amber. Whatever guy can do the most for her is where she’ll float to. The guys think the girls don’t like her because she’s pretty. The girls don’t like her because they’ve seen Amber’s game played a thousand times in the real world and guys are stupid enough to keep falling for it. Amber was only into one man sexually speaking and it was devin, she made it quiet clear she was into tall dark men and that devin was her type (physically, I am sure it only took a week to figure out he was mental). I honestly don’t see a big difference in the looks category between Caleb and Cody, frankly they look similar enough to be related, so it would make no sense to me why she’d like one but not the other. That being said Cody does resemble a young john travolta like in saturday night fever. Devin claimed JOEY, yes the one he evicted was his type (initially) and caleb claimed amber was his type. Then after evicting Joey and nominating brittany he fell in love with her. Devin, Devin, Devin, I just feel sorry for you man. I would like you to stay another week or two, because you make the feeds so entertaining. If Devin leaves. I hope all the drama doesn’t leave with him. If Devin leaves this week, it’s going to be boring next week. Yeah, if you watch the feeds. Everyone gets along, it is all hugs and “i love you”. If I hear one of them say “i love you” one more time, I am going to barf. Frog’s catching on quickly to the TA thing….love her or hate her, she’s pretty sharp. I think she’s in the running for this thing. Check it out. Donny (whom I love, btw,) gave frog the schpiel about Amanda’s cousin, she went IMMEDIATELY back outside and said she thinks there’s an America’s player in the house. I’d call that quick perception. I love Nicole, she’s my favorite player so far. However, if she really wants to win, she needs to start not being so afraid to get blood on her hands like she was during nominations. She is smart, and she should be considering she’s a super-fan of the show. But right now, she can only win against certain people. She needs to start doing impressive things to build up a resume. Cody is so effin’ gay! What short memories since last week! Cracks me up. We’ve misjudged Devin so. Laughable. She is just sour because none of the guys are flirting with her. She isn’t that attractive, the guys are out of her league. So of course she is going to say what she said about the guys on this season. yeah but Zach calls her a B..and She is really, really afraid of Devin?? Why does it seem like so many peopleare against Donny now? Its ridiculous isn’t it. Poor devin…GAG!!! Hes a d*ckhead and I hope he leaves. I really don’t think it will be boring in the house next week if Devin leaves. Like as if hes so exciting to begin with. Everyone was sick of hearing about him last week and now all of a sudden its “keep him hes so classy and special”…You are half right!! Once he leaves people will panic because the house’s favorite target will be gone and they now have to choose from people they like ,so who would be next. Let the backstabbing continue. I did your laundry once Frank and there was a thong in there. Christine said in BBAD that she can’t stand looking at Devin. I can’t stand looking at her……I keep wondering if she is a man in drag. She’s so ugly I can’t imagine any man sleeping with her except if she dons a paper bag over her face. As for her laugh, it drives me nuts! Man there’s some crazy people posting comments. I dont see the difference between half of you and Devin. Except he is on BB. Devin has no one who will work with him and he will be a target regardless. Caleb is love struck, but Cody and Amber are getting closer and Caleb is going to self destruct. 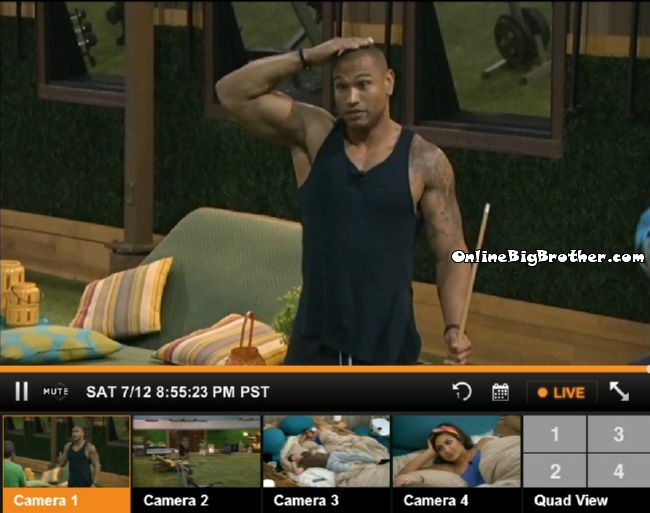 Whats worse, Caleb going after Cody or Devin going after, (who cares) he doesnt have the vote. I mean its simple. Taking out Devin who du his own grave and has no one to work with or Caleb who has a chance to pull people in. I hate to say this but Zach and Cody are the only ones thinking this week. On a side note Christine is a POS for the way she talks aout people I.E. Devin. I really wanna tear into her but thats childish but she reallys is a tool. I only like Hayden n Donny in this game and I dont see that changing anytime soon. All these people love each other, half the guys dont know if there straight or not, Nicole has gamplay but doesnt play, Brittany just wants someone to trust, Derrick is Devin 2.0, Amber is playing like Zuckerman, the call girl edition, Christine is ??? I dont know and I dont care. Donny is palying smart but he still letting Derrick who he knows is up to no good control his vote and his decisions, Caleb is just straight lost, Cody and Zach are in a fraternity and the rest dont matter. Devin needs to stay and Jocasta needs to go. Theres no reasn for her to be here. She’s not playing and she was on her deathbed yesterday.